Thallus: shrubby to subpendant, 2 to 12 cm long, forming dense erect to subpendant tufts branching: anisotomicdichotomous basal part: concolorous with the branches, to distinctly blackened branches: cylindrical to irregular, inconspicuously segmented; lateral branches: not narrowed at point of attachment segments: terete and ±cylindrical, sometimes slightly swollen, foveoles or transversal furrows often present papillae: usually numerous especially on main branches, verrucous to cylindrical tubercles and fibercles: generally absent fibrils: unevenly distributed soralia: deeply excavate, tearing off the cortex around the soralia, as large as the branches when mature, often reaching the central axis and encircling the branches, ±widely spaced and usually not confluent, arising initially on the cortex; soredia: generally farinose isidiomorphs: always absent Apothecia: not seen cortex: thin (5-7%) medulla: thick, lax to dense axis: thin to moderately thick Spot tests: medulla K+ yellow turning dark red (or deep yellow), C-, KC-, P+ orange or K-, C-, KC-, P+ deep yellow Secondary metabolite: salazinic acid (major) or psoromic acid (major), respectively relative to spot tests. 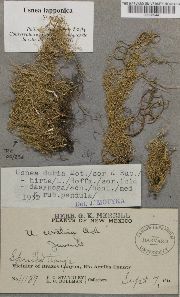 Substrate and ecology: on bark, especially on Abies spp., Pinus spp., Picea spp, and Quercus spp., usually in mixed conifer forests, between 2300 and 3400 m World distribution: holarctic, mainly in continental areas Sonoran distribution: common at upper elevations in Arizona and extending to Chihuahua, rare in coastal areas of southern California and Baja California. Notes: For differences between Usnea lapponica and U. fulvoreagens, see under the latter species.